A herb is a useful plant. 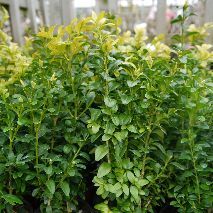 It might be an annual, biennial or perennial herbaceous plant, a shrub, tree, climber or succulent. Herbs are used as flavouring in cooking, curing meats, cooking oils, soft drinks, liqueurs, beers and teas. They are also used in cosmetics, medicines, insect repellents and cleaning products. Many herbs have multiple uses. 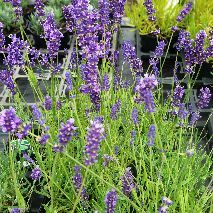 For example, a hardy Lavender such as Munstead might be used as a flavouring in a cake, an ingredient in a cola drink, an essential oil for aromatherapy, a constituent of soap, shampoo or hand cream, or as insect repellent and perfume in a wardrobe. Garden plants like honeysuckle, clematis, camellia, ceanothus or phormium that we may think of as purely decorative are, or have been, useful medicinal species in other parts of the world for centuries. The uses of herbs for food and medicine have their origin in pre-historic times. Neolithic diets included wild fruits and herbs still used by medicinal herbalists. Until travel and trade expanded, each region of the world relied on native wild plants for flavour and healing. In Great Britain, native meadowsweet, St. Johns wort, cowslip, primrose, self heal and so on would have been the herbs used until Roman times. The Romans brought Mediterranean herbs- myrtle, bay, rosemary, lavender, thyme and sage. Strong flavoured herbs such as rosemary and hyssop masked the taste of meats that were not refrigerated. These herbs also contain small amounts of antibacterial compounds. The range of herbs used increased during the Middle Ages when the monastery gardens included plants for cooking, medicines and dyes for textiles. In the 16th century herb gardens began to be planted by universities for teaching botany and medicine. Modern gardens such as the Eden project continue this tradition. There are many myths and legends surrounding individual herb species. Their properties must have seemed magical before science could provide an explanation for the flavours, cures and poisons in them. For example, it was believed that only a witch or pregnant woman could grow parsley, and the Romans thought its use would discourage intoxication in banquets. The Greeks associated parsley with death and decorated tombs with it. Fresh, soft green leaves of herbs such as basil, coriander and parsley are best added to hot dishes at the last moment otherwise their flavour and textures are lost. More substantial herbs such as rosemary, bay and sage can be added at the beginning of the cooking time so that their flavours permeate the dish. Many salad dishes are improved by adding fresh herbs or herb dressings. What to eat with what? Amounts of herbs to include depend on individual taste, but generally larger amounts of fresh herbs are needed than the equivalent dried ones. Many herbs will freeze well, but basil needs to be used fresh from the plant. 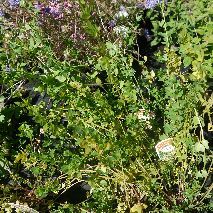 Most herbs grow best in a sunny situation, sheltered from north and east winds. The majority do best in well drained compost or soil. To grow herbs in containers use a Multipurpose compost with added John Innes and mix in at least one third by volume of horticultural grit. Use a container with good drainage holes and do not overwater. Plants can be given liquid feed in summer. Growing herbs in the ground is easy as long as the soil is well drained. They need no manure or special feeding and thrive on being clipped and harvested for your use. Many herbs, such as rosemary, lavender, sage, thyme and oregano are Mediterranean plants by origin and thrive in hot, dry summers. The few herbs you can grow in shade or partial shade include sweet cicely, sweet woodruff, bugbanes, mints and wild strawberries. Give herbs plenty of space to grow and they will reward you with ample leaves and flowers to harvest.